Writing partnerships aren’t uncommon in comics, but I’m always cautiously optimistic about them. Oftentimes the pairings don’t work, and the writers end up trouncing the facets of their storytelling I admired about them in the first place. In THE AMAZING SPIDER-MAN: FAMILY BUSINESS, fan-favorite writers Mark Waid and James Robinson partner with penciller Werther Dell’Edera and painter Gabriele Dell’Otto to throw a new curveball into the life of our Friendly Neighborhood Wall-Crawler: a sister. The result is a fun, if fleeting, action-packed romp, which takes Spidey from Manhattan all the way to Cairo, with several stop-overs along the way. Whether events in this narrative affect future continuity in the on-going monthly Amazing Spider-Man series seems unlikely: but for all intents and purposes, FAMILY BUSINESS throws the spotlight on the Peter Parker we know and love. Waid and Robinson, long-time pros, avoid excessively detailing ‘the story so far;’ we’re thrown into the action immediately, and pick up the necessary pieces along the way (such as the fact Peter Parker’s parents were CIA operatives). 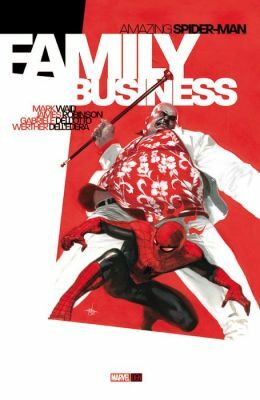 In this tightly-plotted 100-page adventure, Spidey is cast as the Jason Bourne archetype, and he and his never-before-seen sister (a CIA operative, like their mother and father) partner together to deny the bad guys (lead by Wilson Fisk, The Kingpin) whose diabolical schemes link back to the deceased Richard and Mary Parker. Of course, everything is not what it seems: there are double-crosses and revelations along the way, and the writing duo ratchet up the tension nicely. We’ll never know how the writers plotted and scripted this graphic novel, but it’s a partnership that works. Dell’Otto and Dell’Edera work in beautiful tandem to create 100 pages of stunning artwork. The painted style isn’t integral to the success of the story – FAMILY BUSINESS would’ve worked with a more traditional artistic style – but in this oversized format, their work really benefits. Waid and Robinson allow the illustrators the space to let their artwork breathe; the full-page shots of Spider-Man swinging into action are, well, amazing. The action-sequence inside a lavish Monte Carlo casino is especially wonderful. There’s a lot to like about FAMILY BUSINESS, and it’s a fantastic package, reiterating the decision by Marvel Comics to completely overhaul their line of original graphic novels. But as fun and action-packed as the story is, it’s perhaps too light-hearted. Given the format and the marketing push behind these graphic novels, I’d like to see writers offering readers something special, something different. There is no denying FAMILY BUSINESS is a fabulous Spider-Man story, and my copy will eventually grow dog-eared from recurrent readings; but it’s nothing that wouldn’t be possible in the monthly comic book series. That minor quibble aside, for new and long-time Spidey readers, you’ll get your money’s worth here.